I’m not a fan of scary movies. And if there’s anything I dislike more than a horror movie it’s a horrible leader. Horrible leaders are not only scary, but they can be a living nightmare. I know you have experienced a bad leader. Many research studies agree that three out of four employees report experiencing a bad boss that increases their level of stress. If you haven’t had an encounter with a horrible leader, you are a rare exception. Do you know if you are a horrible leader or if you are following a horrible leader? Some leaders don’t intentionally set out to be a horrible leader, but it is because they lack the skills needed to effectively lead people. There are reasons for this lack of skill, but a big part of this deficiency includes fear, insecurity, pride, and carelessness. 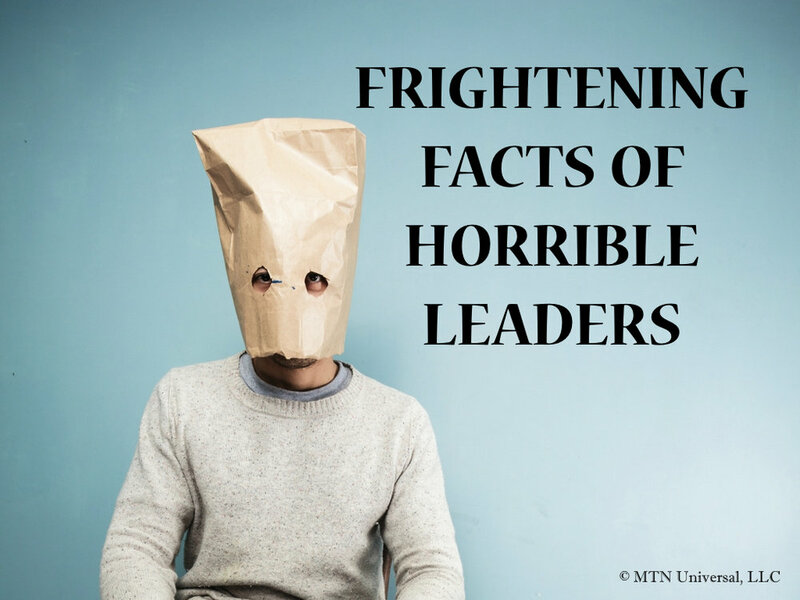 Whatever the reason, I want to share a few frightening facts of horrible leaders to understand if you are developing into a bad leader or if you are working for a bad leader. Your awareness of these facts can keep you from falling into the category of being a horrible leader. More importantly, it will keep you living a nightmare or making someone else’s life a living nightmare. 1. Horrible leaders are self-serving. It is scary thing to follow someone who only cares for his or herself. Leaders great at promoting self could care less about promoting others. Don’t get me wrong; it is important to develop yourself. But a great leader also cares about developing others. 2. Horrible leaders evade responsibility. Another true and alarming fact is that horrible leaders love to “pass the buck.” Bad leaders like to blame others for their own failures. 3. Horrible leaders lead with threats and intimidation. There are many ways to lead yourself, your teams, and your organizations. How are you leading? Those who are insecure and unsure of their leadership usually will lead with intimidation. If you look back at the worst leaders in our world’s history, you will discover leaders that breathed threats and intimidations. This type of leadership breeds fear, but not strength, values, and courage. Great leadership is about influence, not intimidation. 4. Horrible leaders think they know everything. How many leaders have you seen that came across as if they knew everything? This type of leadership stems from insecurity. It also stems from a genuine sense of superiority. Yes, leaders should go first and be the example. But a leader must not think they are better than the people they are leading. A leader that thinks he or she knows everything really doesn’t know enough, therefore causing limitations in many areas of the leader’s life and the organization. Horrible leaders think they can do it all by themselves. On the other hand, great leaders surround themselves with people who smarter than they are. And they don’t care who gets the credit. No one wants to live the nightmare of dealing with a horrible leader. Don’t make these frightening facts part of your leadership. What can you do to ensure that will not become a horrible leader? Please leave a comment below.